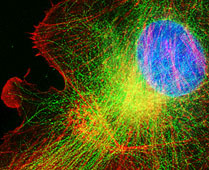 What two, three or four fluorescent dyes should we use for multi labeling? For instance, let's say your have cultured cells or a vibratome section of tissue and you want to look at DNA, f-actin, your favorite protein and microtubules (tubulin) by fluorescent light microscopy. We might suggest you use respectively DAPI (binds to DNA), fluorescein (bound to phalloidin which binds to f-actin filaments), Cy3 (antibody method for your favorite protein) and Cy5 (antibody method to alpha or beta tubulin). Custom filters can be purchased and there may be more filters available since this web page was last updated. For questions about GFP, mCherry, etc. Please visit the Fluorescent Protein Resource Center. N.b. 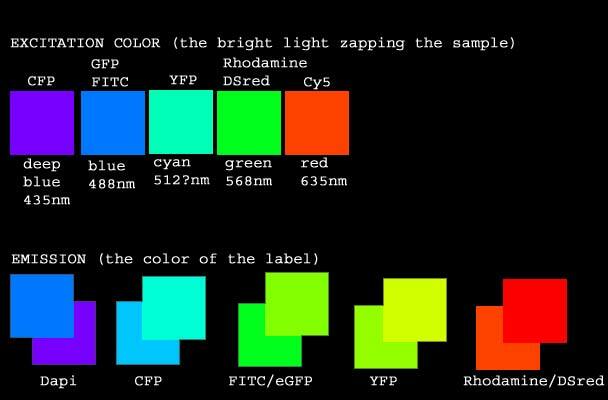 FITC, GFP and other green labels cannot be imaged with DsRed! The Leica AOBS uses variable spectral detection instead of traditional emission filters. There are a few laser lines for excitation and the dyes are limited by these. Any dye that is excited at one of these following wavelengths can be used. 405; 458; 476; 488; 514; 543; and 633 nm. N.b. that there is no line at 568 which is the best line for reds similar to rhodamine. An often asked question is, What is good for labeling nucleic acids other than DAPI? This is an important question because Dapi & Hoechst cannot be used with the confocal or with CFP. The first answer we provide is propidium iodide in the red range because it is so easy to use. But there is a new family of nucleic acid stains by Molecular Probes called Syto. Nobody has used them in the AIF so we can't recommend them, but we'd love somebody to try and show us the results. The most promising Syto dyes appear to be Syto 13 or Syto 16 in the green range or Syto 60 in the infra red range. When FITC is excited, it produces free radicals which can be very harmful to live cells. Also, FITC is pH sensitive such that its intensity changes depending on the pH. And FITC bleaches very quickly. For these reasons, we recommend more stable and brighter Alexa 488 or Cy2 instead of FITC. Or, if you can, switch to a red probe such as Alexa 568, Cy3, Rhodamine, or Texas Red. On the digital stations, any custom filters can be built for any wavelenths between 360 nm and 700+ nm. For instance, we have special filters on Digital Station #1 for double labeling and time lapse imaging of cyanFP and yellowFP. Digital Station #3 has a few special filters, for instance for chromosome painting. And the Leica AOBS confocal can image any part of the visible spectrum without using filters. This is how the author of this web page perceives the colors. Always mount coverslips with an anti-fading agent such as 0.1M n-propyl gallate (Sigma) in 50% glycerol.PBS pH 7.0 and seal edges. Store slides in refrigerator. Besides that it is carcinogenic, we recommend not using phenylenediamine as an anti-fading agent because it can react with cyanine dyes (especially Cy2) and cleave away half of the cyanine molecule. Use of phenylenediamine as an anti-fading reagent in mounting media may result in weak and diffused fluorescence after storage of the stained slides. Method to detect nucleic acids (DNA and RNA in nucleus and chromosomes) and RNA in cytoplasmic ribosomes: Propidium iodide (Molecular Probes) staining solution prepared as follows: dissolve 1 mg of PI in 50 ml of PBS (5mg/50 ml sol'n can be used, but the less concentrated works for most applications). Store in the cold in a brown bottle covered with aluminum foil or in 1 ml aliquots. When ready to use, bring PI sol'n to room temperature. Stain fixed tissue sections or fixed cells in culture (fixed either with glut, a mixture of glut/formaldehyde or formaldehyde) for 5-10min in the dark at RT. Rinse in PBS and mount with fluorescent mounting medium. Time of staining will have to be determined for your samples. Warning regarding steptavidin: It has been reported from users that biotin conjugated to antibodies followed by streptavidin conjugated to fluorochromes may come unbound after a few days and give the appearance of punctate staining in background. For spectra of most dyes available, see Molecular Probes' web site. Another cool site for spectra at Omega Optical. Please send us suggestions for changes to this page.